Novotný LVS 511 is the smallest machine in Novotný forwarder range. This 5 ton loading capacity machine has been designed mainly for thinning. Its compact small size forwarder with minimum impact on forest ground. Spacious and safety cabin together with comfortable revolving seat provides the driver perfect environment. Forwarder is built from components from leading suppliers. 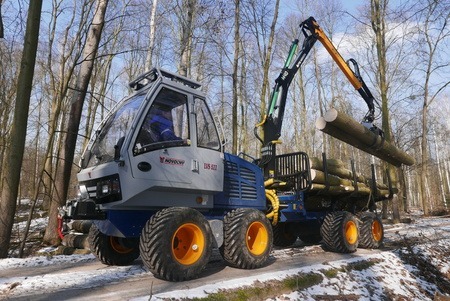 Powerful and fuel economic Cummins engine together with perfect Bosch Rexroth hydraulic components make the machine effective in all forest conditions. The 8 wheeled narrow chassis is sturdy and reliable. Quick and precise crane make the high productivity of machine and help the operator to minimize damages on standing trees. 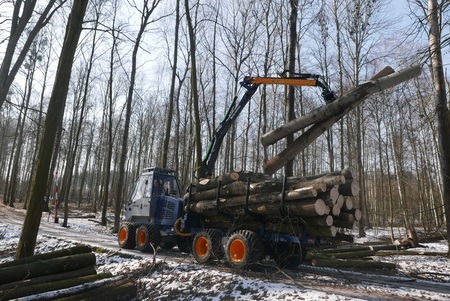 Bosch Rexroth locking system - flow divider - enables smooth movement with full load even in the roughest forest terrain. Forwarder LVS 511 is easy for service with low operation and maintenance costs. LVS 511 is thanks to its technical parameters ideal forwarder for CTL method in thinings. We are also offering wide range of optional equipment which makes the forwarder more versatile for different purposes.